Sign-ups and try-outs, boys and girls, 3rd Grade through High School. 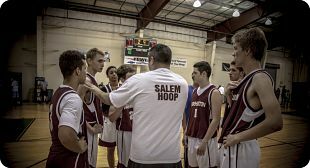 The Hoop is the ultimate health, fitness and sports experience in the Willamette Valley. Offering a full menu of services and amenities, The Hoop combines a unique blend of fun and fitness, service and programming to ensure a completely satisfying experience upon every visit. The facility itself is unlike any other. We have over 51,000 square feet including 6 basketball courts and 6 volleyball courts. That’s one of the largest number of courts in any private facility in the Northwest. Regional competitions can be held here, all under one roof. If you want to compete in a league, tournament or competition, you’ll find the environment is always clean, safe and climate controlled. All activities are organized and begin and end when they are scheduled. It is a flexible space used to host events of many types with seating for up to 3,000 spectators. Our real expertise lies in our ability to organize and execute national, regional and local competitions and sporting events at competitive levels players expect.